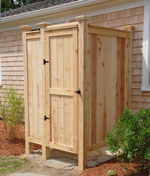 For quick reference for outdoor shower plans and installation, our outdoor shower installation guides to the right offer detailed specs on assembling our outdoor shower kits. For the standard model, refer to our video for the a great reference to align your outdoor shower plans and kit assembly on youtube – a quick 10 minute guide to help you see it in real time. Your outdoor shower kit will arrive with all the materials needed. 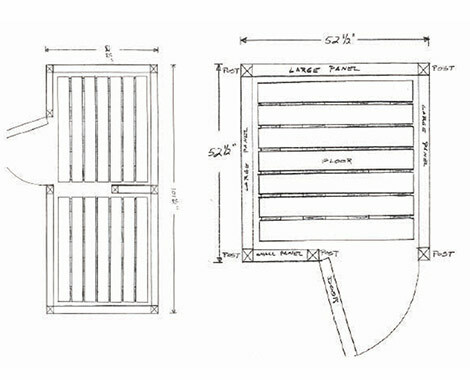 We basically building our outdoor shower off designs and detailed outdoor shower plans and then send you the kit like a pre-fab. All you need are a few tools like a screw gun to get the outdoor shower done. For refinements like posts caps against the house, you may need a small saw. Depending on your “handyness” on the scale of “What’s a phillips head?” to “I only think in board feet!” , expect anywhere from 2-4 hours for the standard sizes and a bit longer for deluxe styles. We do recommend 2 or 3 people…and even a 4th to watch and brag later that he/she did everything! 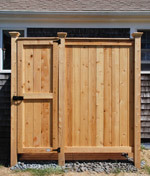 Refer to our outdoor shower plans / installation or the video as useful guides. A common question we get with outdoor shower plans and kit assembly is regarding drainage. Each city, town, state, municipality has its own details where mostly we have not seen any restriction in that regard. Drainage can easily use a small carved out area with beach pebbles, a cedar floor, or if you’re handy, a french drain.